The Census Bureau recently released its 2014 Q4 Housing Vacancy Survey (HVS) data, giving us a complete look at the boom and bust in homeownership rates over the last 20 years. The HVS’ reported homeownership rate, though far from perfect, remains the most up-to-date and cited statistic on homeownership in the U.S., and thus an important barometer of the housing status of American households. One advantage of the HVS is its long time frame, going back to 1965 at the annual and regional level, which helps to put recent trends in homeownership into a historical context. Figure 1 shows that the national homeownership rate rose steadily through the late 1960s and 1970s, from 63 to 65.6 percent, before declining slightly in the early 1980s. After a decade of stagnation, the rate rose rapidly from 1994 to 2004, from 64 to a record high of 69 percent. 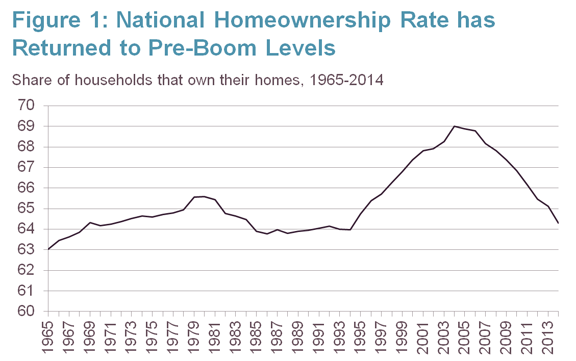 Since then, however, the national homeownership rate has declined almost fully back to its 1994 level. The roller-coaster ride of the national homeownership rate from the last 20 years, while dramatic in its own right, only tells a small part of the homeownership story. Another advantage of the HVS data is reporting on homeownership rates for subsets of households by race/ethnicity and age, which add important texture to this story. 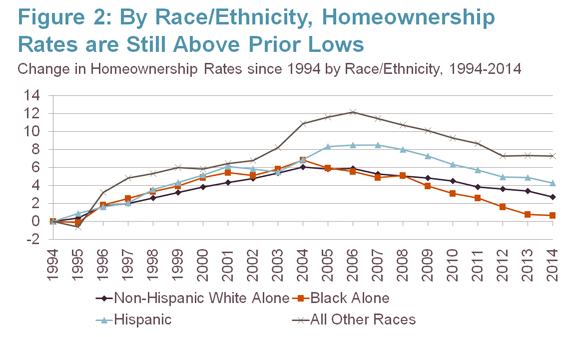 Homeownership rates by race and ethnicity, for example, have generally followed the same up-and-down trend as the national rate, although no identified racial or ethnic group has given back all their gains. Indeed, when measured by the difference in their homeownership rates relative to 1994, only blacks are close to their former level (Figure 2). Households in the ‘other’ category (mostly comprised of Asians, Pacific Islanders, and multi-race householders), which grew their share of homeowners by 12 percentage points during the boom, remain fully 7 percentage points up today. Notes: Hispanic includes all races. All other races includes multiracial. Source: U.S. Census Bureau, Housing Vacancy Survey. 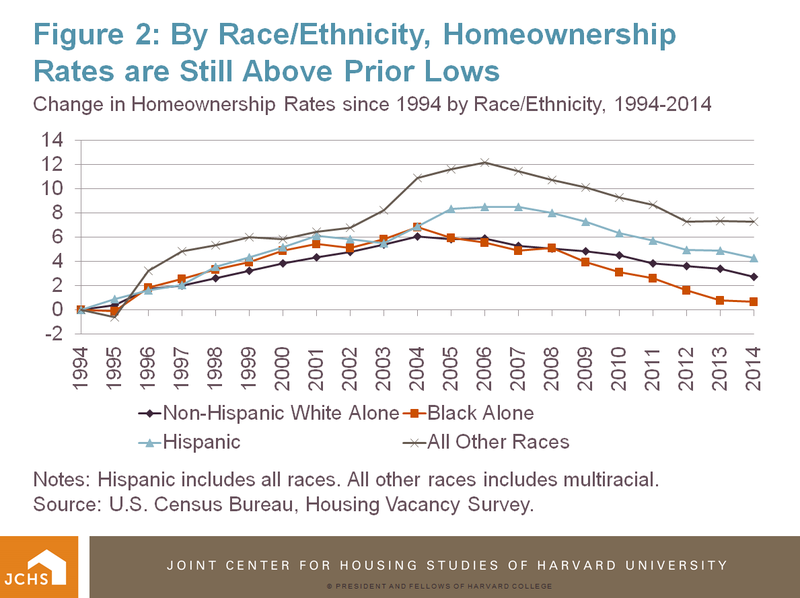 The reason the national homeownership rate has declined all the way back to its 1994 level, even when no individual racial or ethnic group has done so, is because of the simultaneous shift in the race/Hispanic origin composition of households in the U.S., which has increased the share of all households that are headed by a minority. Due to the lower homeownership rates of minorities, relative to non-Hispanic Whites, this shift automatically lowers the homeownership rates of the nation, independent of any changes in minority-specific homeownership rate. The second set of data from the HVS to shed more light on homeownership trends are the changes in rates by age of householder. Similar to the breakouts of homeownership rates by race and ethnicity, most of the age groups identified share the same rise and fall trend over the last 20 years, although householders ages 65 and older did not decline appreciably following the mid-2000s boom (Figure 3). The youngest households, those under age 35, gained the most in their homeownership rate during the boom, but have since declined to one-and-a-half percentage points below their pre-boom rate. Middle-age groups, meanwhile, have seen their homeownership rates fall nearly five percentage points below their mid-90s level, with 35 to 44 year olds experiencing a full ten percentage point swing in the last ten years. 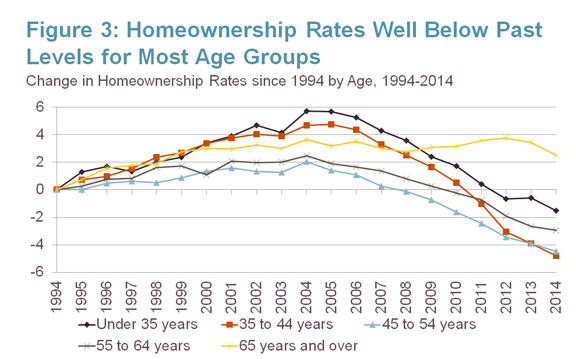 These dramatic declines are greater than the overall decline in homeownership because of the shifting age composition of households, which have skewed older over the last twenty years as the baby boomers progressed into higher ownership middle and early retirement ages, being replaced in the 25 to 44 age group by the smaller and more racially diverse Generation X cohorts with lower ownership rates. 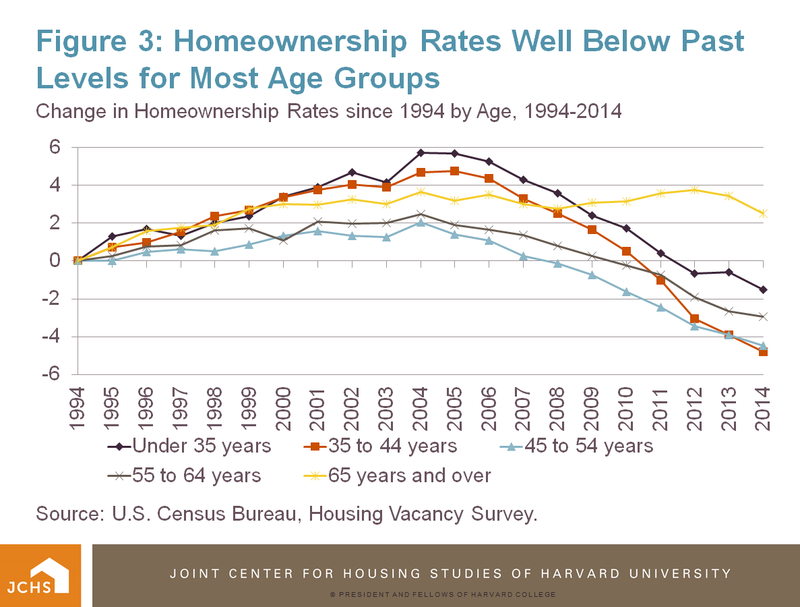 The low levels among younger cohorts, however, do suggest that the national homeownership rate is only back to its mid-90s level because of sustained homeownership by older households, and that among those in their prime working years the actual homeownership rate is indeed well below so-called ‘normal’ levels. A quick glance at these data may raise some concerns about the future of homeownership, especially for younger households and minorities who will account for large shares of households going forward. Yet caution should be exercised in extrapolating these trends forward. For one thing, the HVS data often shows unexplainable jumps in quarterly rates and counts of households, which are somewhat muted by these annual averages. Second, recently moderating house prices and a move to relax lending restrictions, along with the reduction in FHA mortgage insurance premiums, should give home buying a boost. Third, most people, and especially young adults, remain in favor of homeownership, despite the risks exposed during the recession and foreclosure crisis. For these reasons, few analysts expect homeownership rates to fall much further. 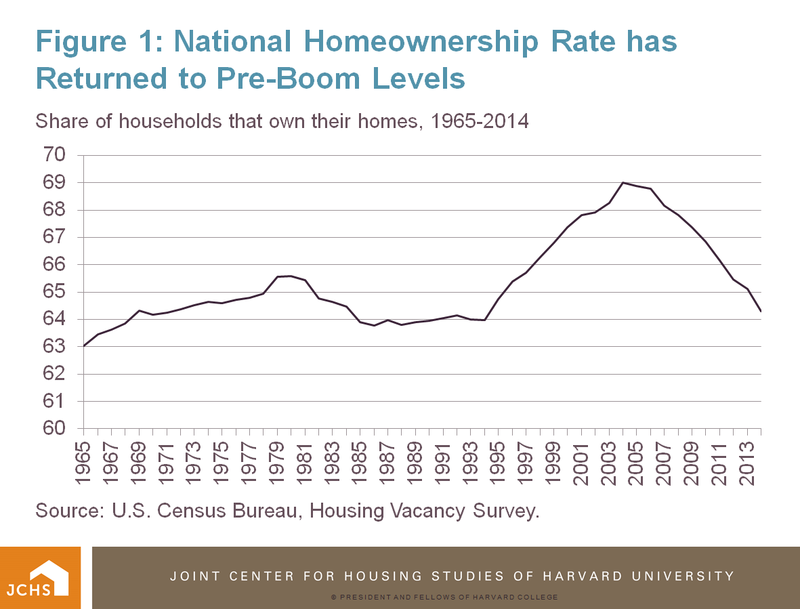 If it were to happen, however, the story would change from one of returning to a pre-boom norm of about 64 percent, to entering a new era of low homeownership rates unlike anything we have seen in the last 50 years.